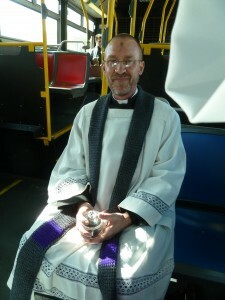 This past Ash Wednesday, I had a real experience with public on-the-street street ministry on behalf of my internship congregation, Christ Church Lutheran. 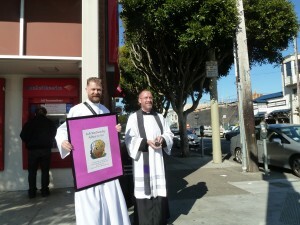 For the first time in the life of the congregation, Pastor Steve Sabin (at right) decided to try Ashes to Go on the street in San Francisco. It was an interesting experiment in being public witnesses to God's call. 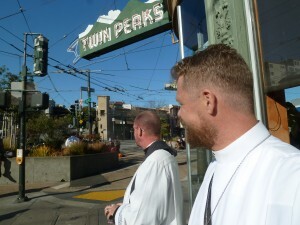 We started out from our midday service, and without removing our vestments we waited for the 66 MUNI bus. Even before the bus arrived a woman asked for imposition of ashes. Steve performed the rite, "Remember that you are dust and to dust you shall return," and blessed her and she went on her way. When the 66 bus arrived we hopped aboard it and traveled to 9th and Irving Street (at left) in the Inner Sunset, a district with trendy shops and eateries adjoining the UCSF Medical Center. As we arrived we started to stand on the same corner that some people who were getting signatures for a petition. We decided it would probably be better to move to a different corner so as not to create too much competition among those looking to engage the public in some manner or another. Surprisingly enough, one gentleman who was signing people up for Greenpeace crossed over to our corner to engage us in conversation about what we were doing. Although he wasn't interested in receiving ashes, he was familiar enough with the practice, having been brought up Roman Catholic. Our reception was phenomenal. Over the course of an hour and a half, we had over fifty people come up to us to receive ashes in the form of a cross on their forehead. People from all walks of life, young and old, men and women, of all different colors. Roman Catholics as well as non-Roman Catholics, people who weren't sure they were going to make it to church later, people who hadn't been to church in years. 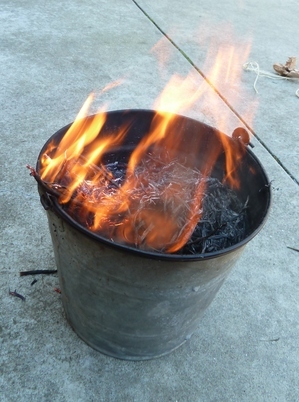 A number of people who chose not to receive ashes made it a point to inform us that they were happy to see us there. A few people who didn't receive it thanked us for reminding them that it was Ash Wednesday and they would be making it to worship services later. People were also surprised that we were there, not looking for something in return but in order to give something out. We certainly garnished a lot more attention than those looking for petition signatures on the other corners. And by the time we left 9th and Irving at 2:45, the other corners had cleared out. After that, we made our way to Castro and Market to try our luck in the heart of San Francisco's historic "Gay district." There were no small number of people who were skeptical about our presence there, especially in a place where the presence of clergy in public traditionally meant that they were going to be yelled at in public to repent of their sins or face certain damnation. Nobody, was, however, outright hostile, and there were at least twenty people who came by in the Castro to receive ashes from us as well. One woman who had already had a cross on her forehead even mentioned that she had gotten it at St. Francis, my home congregation! The truly high point of the day was when we boarded the final bus to take us the last stretch of the trip back to church. The driver saw us and right away asked for Steve to provide him with the rite, "Remember that you are dust and to dust you shall return." ELM has provided this grant to enable this congregation, a fairly high liturgical one with a relatively small attendance, to have an intern, and I am learning so much about parish life by being the Vicar at Christ Church Lutheran. But my spirit truly soars when I am out in public on the street doing public ministry. Ashes to go is a great witness on the street to the public of what being Christian is all about.